ALA Midwinter attendees react as the Youth Media Award winners are announced. 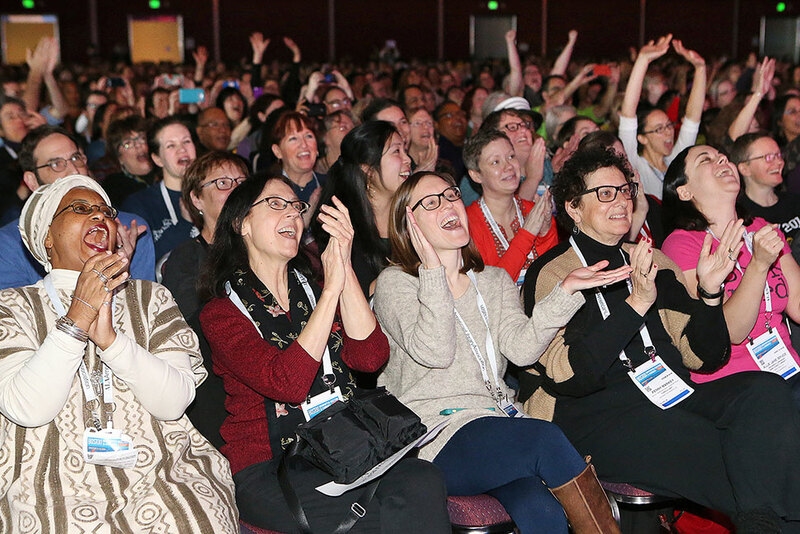 The more than 11,000 attendees at ALA’s Midwinter Meeting & Exhibits in Boston used the conference as an opportunity for in-depth discussions of major issues facing libraries, as well as sharing ideas and solutions that librarians could bring home and apply more immediately. 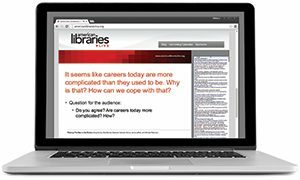 Four goals of libraries—freeing the world’s knowledge, catalyzing contributions, cultivating scholarly skills, and contributing to the development of free information platforms—are not new, radical, or subversive, Zittrain noted, but information technology is developing without the values of the library. Prominent examples include when Amazon’s Kindle remotely deleted customers’ copies of George Orwell’s 1984 when it discovered it didn’t have the rights to the novel, or when Barnes & Noble’s Nook e-reader replaced the word “kindle” with “nook” throughout Leo Tolstoy’s War and Peace. ALA Washington Office Executive Director Emily Sheketoff started the Washington Office Update session with a success story: ALA member calls and letters to their representatives helped to ensure inclusion of library-friendly requirements in the Every Student Succeeds Act that passed Congress and was signed into law in December. Office for Information Technology Policy (OITP) Deputy Director Larra Clark noted threats to public Wi-Fi access that ALA is tracking. These include LTE-U, which can potentially knock Wi-Fi devices off the spectrum; lack of new spectrum being designated as unlicensed; and some policymakers’ unwillingness to recognize the importance of unlicensed spectrum to consumers. ALA is a member of the WifiForward coalition and has created petitions at SaveOurWifi.org, including one for librarians to share examples of what Wi-Fi means for patrons. Also at the Washington Update, new Institute of Museum and Library Services (IMLS) Director Kathryn Matthew introduced the Open eBooks app, one of IMLS’s efforts to harness technology to help students learn. Open eBooks provides free access to top-selling books for low-income kids. OITP hosted a day-long information policy workshop to help libraries understand the laws, regulations, treaties, and jurisprudence governing information use. 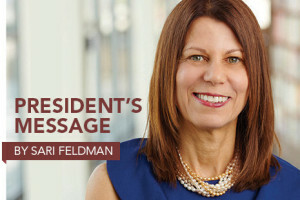 International Federation of Library Associations and Institutions President Donna Scheeder observed that there is no longer a fine line between national and global information policies, and decisions made by multinational bodies can affect domestic information policy. The World Intellectual Property Organization Copyright Treaty and the Trans-Pacific Partnership are two examples addressing copyright. Libraries have credibility on matters of information policy in the eyes of their communities and, by extension, public officials. As a result, presenters urged libraries to engage with legislators and other decision makers as well as coalition efforts. One such opportunity is the Re:Create Coalition, which consists of partners from across the political and organizational spectrum seeking a balanced approach to copyright. The potential value of these types of “strange bedfellows” alliances should suggest to librarians that “there are no permanent friends or enemies,” said presenter Jenny Backus, a former senior policy advisor at Google. OITP also hosted a discussion about an individual’s right to have personal information removed from web searches, prompted by an EU case affirming that right for certain personal information. Abigail Slater, vice president for legal and regulatory policy for the Internet Association, said she has seen a steady increase in the opinion that these European privacy norms should be global. James G. (Jim) Neal, university librarian emeritus of Columbia University, highlighted several areas of that law that he said should concern librarians. Such a law in the US would remove material not just about a person but by a person, which may have unintended and serious repercussions for research. It may create a new digital divide, as wealthier people will likely have more influence over information, and it would increase the challenge of cataloging born-digital content. Any large gathering of librarians provides an opportunity to share knowledge of immediate practical value, and many Midwinter sessions took advantage. Linda Hofschire, an analyst at Colorado State Library’s (CSL) Library Research Service, gave tips on creating effective infographics in her “Data Visualization for the Rest of Us: A Beginner’s Guide” presentation. CSL needed a better way to present the research it had collected on school libraries since the early 1990s. The result: a one-page infographic that its users can show to principals, administrators, and superintendents to jump-start conversations about the impact of school libraries on student test scores. “A well-designed infographic makes numbers much more accessible to people, much more quickly,” Hofschire said. In short, visualizing the data can make a library’s story more meaningful to stakeholders. As always, the Monday morning presentation of the Youth Media Awards was one of Midwinter’s best-attended events. This year’s John Newbery Medal for the most outstanding contribution to children’s literature went to Last Stop on Market Street by Matt de la Peña and illustrated by Christian Robinson. Finding Winnie: The True Story of the World’s Most Famous Bear, illustrated by Sophie Blackall and written by Lindsay Mattick, won the Randolph Caldecott Medal for most distinguished American picture book for children. More than 20 awards were announced at the ceremony. Among the other winners were Gone Crazy in Alabama by Rita Williams-Garcia and Trombone Shorty illustrated by Bryan Collier and written by Troy Andrews and Bill Taylor, which won the Coretta Scott King Author and Illustrator Book Awards, respectively, for outstanding African-American authors and illustrators of books for children and young adults; Enchanted Air: Two Cultures, Two Wings: A Memoir by Margarita Engle and The Drum Dream Girl illustrated by Rafael López and written by Margarita Engle, which won the Pura Belpré Author and Illustrator Awards respectively for books that portray, affirm, and celebrate the Latino cultural experience; and Bone Gap by Laura Ruby, winner of the Michael L. Printz Award that recognizes excellence in literature for young adults. See the full list of winners. ALA Treasurer Mario González presented the FY2017 Programmatic Priorities (CD#13.1) to develop the budget for fiscal year 2017. The three strategic directions for 2017 are advocacy, information policy, and professional and leadership development. Vicky Crone, chair of the Policy Monitoring Committee, presented the committee’s report (CD#17) and requested approval to separate Policy B.2.1.7 Labeling and Rating Systems into two new interpretations (Labeling Systems CD#19.4 and Rating Systems CD#19.5). The motion passed. Freedom to Read Foundation President Julius C. Jefferson Jr. discussed several legal cases the foundation is following (CD#22), including US v. Moalin, Wikimedia v. NSA, and Antigone Books v. Horne. Karen E. Downing and Andrew K. Pace were elected to three-year terms on the Executive Board. John C. DeSantis was elected to an immediate two-year term to succeed Gail A. Schlachter, who died April 27, 2015. 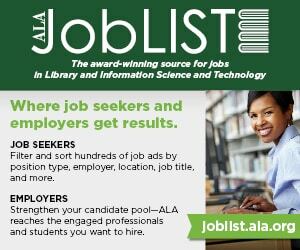 Council approved the Joint Council of Librarians of Color’s application to become an affiliate of ALA (CD#25). Intellectual Freedom Committee (IFC) Chair Pamela Klipsch presented a report (CD#19) announcing the launch of a new journal, In Libris Libertas: A Journal of Intellectual Freedom and Privacy, to replace the Newsletter on Intellectual Freedom. IFC-proposed resolutions on user-generated content in library discovery systems (CD#19.2) and restoring civil liberties and opposing mass surveillance (CD#19.1, coproposed with the Committee on Legislation as CD#20.1) passed. Resolutions concerning accessibility of ALA conferences and meetings for people with disabilities (CD#31), replacing the Library of Congress subject heading “illegal aliens” with “undocumented immigrants” (CD#34), against Islamophobia (CD#32), supporting the 2015 Advocacy Implementation Plan (CD#35), and honoring Librarian of Congress Emeritus James H. Billington (CD#20.2), all passed. 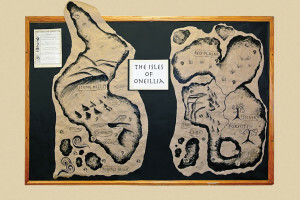 Two proposed changes to the Office for Literacy and Outreach Services (OLOS) Advisory Committee proved controversial. ALA’s Committee on Organization (COO) put forth the proposal at the Diversity, Literacy, and Outreach Services All Committee Meeting. The changes are related to last year’s merger between OLOS and the Office for Diversity. COO proposed changing the OLOS Advisory Committee’s name to the “Equity and Inclusion Office Advisory Committee” and establishing a new mission for the committee. One attendee expressed concern that members would lose representation without the Office for Diversity, while another questioned whether replacing “diversity” with “inclusion” would have the same connotations of what the committee would be expected to do and which populations it would be expected to serve. ODLOS Director Jody Gray assured attendees that she and her staff planned to ensure that the committee’s role would be “needing to hold people accountable in the rest of the organization” for diversity. “There is a real tendency for people to use [the word ‘diversity’] as a shortcut. It has lost its meaning,” Gray said. The use of the word “inclusion” is meant to challenge groups to figure out how they interact with one another. Read the committee’s full proposed mission. Four simple tips she offered for designing accessible graphics are putting numbers in context to make them relatable, using the appropriate type of chart, simplifying information and establishing a focal point, and making it easy for users to find information. A panel discussion on digital humanities sponsored by American Libraries and Gale Cengage offered perspectives on the opportunities in this growing—though not clearly defined—field. David Seaman, dean of libraries and university librarian at Syracuse (N.Y.) University, said that the imprecision of the “digital humanities” term means that institutions can take it in different directions. He also observed that the work is inherently collaborative. “It’s extremely difficult to be a lone digital humanist,” Seaman declared. Thomas Padilla, digital scholarship librarian at Michigan State University in East Lansing, highlighted the release of some 200,000 images from New York Public Library (NYPL) to the public domain as an excellent model for library–faculty engagement. He observed that when collections are optimally usable and transparent, librarians are allowed to play a more active role in the field. At the Young Adult Library Services Association’s “Trends Impacting YA Services: Competencies Needed to Provide Teen Library Services of the Future,” Kyungwon Koh, assistant professor at the University of Oklahoma School of Library and Information Studies, shared results from research she and Associate Professor June Abbas conducted on informal learning and community learning centers in libraries. A survey of 44 librarians and staff members working in informal learning spaces in public and school libraries revealed the most important skills and education they believed were necessary to work in learning labs and makerspaces. The top five core competencies from the survey were the abilities to understand technology, teach others, be willing to learn, advocate and network, and provide user services to different populations. The most important “soft skills” needed for the informal learning environment were flexibility and adaptability, curiosity, patience, creativity, and a social disposition. Survey respondents ranked on-the-job learning as the number one way competencies should be learned. The Office for Diversity, Literacy, and Outreach Service’s Diversity Research Update showcased the results of four Diversity Research grants. Kawanna Bright of the University of Denver discussed “Including the Voices of Librarians of Color,” her collaboration with Amy VanScoy of the University at Buffalo (N.Y.). Based on interviews with eight librarians, they identified themes including the observation that librarians of color tend to serve as insider resources for users of color. Sarah Lightner of Ohio State University discussed barriers to fruitful discussion on race, gender, and sexuality in secondary classrooms. To address these, she developed a pilot study of critical course companions for middle and high school students to read alongside texts on multiculturalism. As part of the Libraries Transform—Civic and Social and Innovation series, Tiziana Dearing, Boston College professor of social work and codirector of the Center for Social Innovation, illustrated the differences between social innovation, social entrepreneurship, and social enterprise. Dearing highlighted five important skills libraries can help leaders develop: maker instinct, immersive learning, rapid prototyping, smart-mob organizing, and commons creating. In addition, libraries provide social innovators the opportunity of “deep, personal engagement with the target community”—one common element of social innovation. In Library Information Technology Association’s popular Top Tech Trends panel, six technology thought leaders shared trends they think will have a major impact on libraries. Jamie Hollier, co-owner of technology consulting company Anneal, and Jason Griffey, founder of technology consulting firm Evenly Distributed, both identified autonomous agents as one of their trends. Robots and logic engines are rapidly improving at using natural language. Hollier uses Amy (x.ai) as a personal assistant for scheduling meetings, and she said that Amy’s emails were so good that her clients wanted to meet Amy in person. Ken Varnum, senior program manager for discovery, delivery, and learning analytics at the University of Michigan Library in Ann Arbor, spoke about campus learning analytics. He said that his library is planning a process for learning in which features of academic institutions and behaviors of students contribute to academic success by tracking student movements through the university environment. He also discussed privacy concerns related to the project. At the “How Do You YouTube?” session, three librarians discussed their promotional video efforts. University of Iowa Librarian Colleen Theisen developed her Staxpedition web series to help make users aware of the library’s special collections and make them less intimidating to explore. “By making anything, we’re starting to meet those goals,” she said. His upcoming memoir I.M. is another expression of creativity, although its deeper purpose is also evolving. “I thought I knew why I was writing the book, but as I started writing, the why became another deeper question,” he said. He revealed that the memoir will include discussion of his formative years—which he described as both “great” and “terrible”—attending a yeshiva school from kindergarten through 8th grade, and the bullying he experienced there. Anti-bullying activist Lizzie Velásquez presented the Arthur Curley Memorial Lecture. Born with neonatal progeroid syndrome, which prevents her from gaining weight, she initially experienced psychological bullying because she didn’t look like other kids. However, she decided to stop letting others define her and created her own truth, even trying out for and making the cheerleading team. When she was 17, she came across a YouTube video calling her “the world’s ugliest woman.” That initially crushed her self-constructed truth, but the assistant principal at her school encouraged her to try public speaking. She has since become a bestselling author and a sought-after motivational speaker whose TEDx talk “How Do You Define Yourself?” has been watched more than 10 million times. While social media has the capacity for malice, she said its power to make friends around the world and create a platform to help others makes her a huge supporter. She’s been using her Twitter and Instagram accounts as part of her efforts to get the Safe Schools Improvement Act passed. At the ERT/Booklist Author Forum, documentarian and writer Ken Burns and writers Mark Kurlansky and Terry Tempest Williams described how their work encapsulates the writer as a witness to history and real-life stories. “I’ve always asked myself: Who are we? Who are those strange and complicated people called Americans?” Burns declared. Civil rights activist Mary Frances Berry keynoted the 16th annual Dr. Martin Luther King Jr. Holiday Observance and Sunrise Celebration. She asked the audience to commit to doing something every day for the cause of justice—and voting is only one step toward that end. ALA President Sari Feldman said Booker’s appearance was an opportunity to share with him how libraries transform individuals and communities and the messages underlying ALA’s multiyear Libraries Transform public awareness campaign, which launched in October 2015. “Recasting the story is incredibly important to winning the support of national decision makers like Sen. Booker,” said Feldman. AARP CEO Jo Ann Jenkins spoke about ways to reimagine growing older as the population of the US ages. “Change the conversation and we change the reality of aging,” she declared. Jenkins highlighted three areas where change is most needed for individuals and society: health (preventing disease and improving well-being); wealth (having adequate financial resources for life and contributing to economic growth); and self (a sense of purpose and a positive self-image). Libraries have “a huge role to play” in helping older communities pursue the freedom to learn by equitably providing access to information to users of all ages. Closing Session speaker Chelsea Clinton shared stories from her book It’s Your World: Get Informed, Get Inspired, and Get Going! which encourages kids to engage with something they’re passionate about to make a positive difference in their communities. She told stories about Haile, who created an online cookbook of healthy meals after her father was diagnosed with diabetes, which led to an opportunity to reshape kids’ meals at Hyatt hotels; Alex, who created the Brick Share program to collect and donate Legos to kids without access to toys; and Celia, who recruited basketball star Yao Ming for an anti-ivory-poaching awareness campaign in China and Hong Kong. Amy Carlton, Terra Dankowski, Erica L. Jenns, Stephen Mayeaux, Willie Miller, Phil Morehart, Sanhita SinhaRoy, and Charlie Wapner contributed reporting for this story.